Forces make things happen. Forces speed things up and forces slow things down. There are attractive forces and repulsive forces. An attractive force pulls magnetic decals to the refrigerator door and pulled Comet Shoemaker-Levy into the churning surface of the planet Jupiter; a repulsive force pushes two strips of scotch tape apart after they are stripped from a table top. In the arsenal of physical concepts, force is one of the most important. The natural world pulsates with a diverse range of activities. Galaxies teem with violent, energetic outpourings; stars are born, evolve through different stages as they burn their supply of hydrogen, and when that supply is exhausted, they die; planetary systems form along with parent stars and, as we know from the Sun's family of nine planets, these stellar satellites exist in greatly different forms. Organic matter exists on at least one planet in the universe and does so in a staggering range of sizes, shapes, and dispositions; living organisms interact with their environments, altering each other as time advances. Below the visible, atoms and molecules do their tangos bringing together the chemical elements in a myriad of combinations to form and shape every mate rial object; and still further below the powers of our visual capabilities are the fundamental particles that seethe inside matter and throughout the vacuum of the universe. This profusion of activity, from galaxies to gluons, is the consequence of four basic forces that individually and in tandem govern all of nature's processes and cause everything that happens to happen. The most familiar member of the four basic forces is gravity, which, though the most feeble, reigns supreme in the universe at large. The gravitational force binds galaxies into groups, grips stars together in galaxies, crunches large, dead stars into black holes, holds planets in orbit around their parent star, and keeps the feet of children and their puppies firmly on the ground. The electromagnetic force shapes both the living and nonliving worlds, attracting and repelling the atomic-molecular units that determine the architecture of material objects. The electromagnetic force endows a chair with the ability to support a seated person against the pull of gravity. The weak force governs certain behaviors of the basic particles. Unstable atomic nuclei that decay by the emission of an electron, called radioactive /3-decay, are an example of a process governed by the weak force. Finally, the strongest basic force of the four is the force that holds the atomic nucleus together and is called, simply, the strong force. The strong force is 1040, that is, 10,000 trillion trillion trillion times stronger than the gravitational force. The gravitational force is weak relative to the other basic forces, but it dominates the cosmos because the gravitational force is always attractive and because stellar and galactic masses are so enormous. Figure 13.1 The attractive gravitational force pulls the two masses together along the line connecting their centers. by every student of physics. 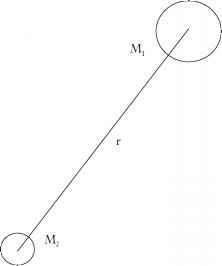 The gravitational force between two objects increases in proportion to the product of their masses (M1M2) and decreases in proportion to the square of their separation (1/r2). Newton went further. He demonstrated that the attractive force is a central force, which means it acts along the line connecting the centers of the masses. Knowing the masses of two objects and their separations, the magnitude of the gravitational force acting between them can be calculated exactly (see Figure 13.1). Because the gravitational force is known in quantitative detail, the appearance of comets and the coming of solar and lunar eclipses can be predicted with unerring precision. Physicists strive to understand each of the four basic forces in complete quantitative detail. As soon as the atomic nucleus was recognized as a collection of protons (and eventually neutrons), physicists knew that a special new force was required. The reason is straightforward: each proton is positively charged and the electromagnetic force between the like-charged protons is repulsive. But nuclei exist in stable form, and since they do, a new attractive force is required to override the repulsive electromagnetic force and hold the nucleus together. The domain inside an atomic nucleus is an interplay between the electromagnetic and the strong forces. Following James Chadwick's discovery of the neutron in 1932, and throughout the decade of the 1930s, the atomic nucleus became the frontier of physical research. And pushing the boundaries of this frontier were many American physicists. By 1930, the young physicists who had gone to Europe during the 1920s to be where the new physics was being created had come home. During their sojourn in the European laboratories, physicists like Edward Condon, J. Robert Oppenheimer, and I. I. Rabi resolved among themselves to bring American physics out from under the dominating shadows of Niels Bohr, Werner Heisenberg, Erwin Schrodinger, Wolfgang Pauli, and the other leading European physicists. These young American physicists vowed to make American physics second to none. By the time the neutron was discovered in 1932, they were well on their way to fulfilling their vow. Three things occurred in American laboratories in 1932: the positron was discovered by Carl Anderson at the California Institute of Technology, deuterium was discovered by Harold Urey at Columbia University, and Ernest Lawrence at the University of California, Berkeley extended the energy of the cyclotron to the 1 million volt level. Thus, the frontier of physics was shifting to American laboratories. Much of the nuclear research originated from those universities where the "boys," who had learned the new physics and had assimilated the spirit of world-class research in Europe, had come home to lead their own research groups. Oppenheimer and Rabi are particularly noteworthy for their impact on American physics. Both Oppenheimer and Rabi returned from Europe in the fall of 1929. Oppenheimer went to the west coast where, in a joint appointment between the University of California, Berkeley and the California Institute of Technology, he trained a generation of American theoretical physicists. Rabi established himself on the east coast where, at Columbia University, he started his molecular beam experimental research. By 1938, Rabi had an extraordinary group of young students and postdoctoral fellows who would eventually distinguish themselves in the world of physics. Among the group were four future Nobel laureates: Rabi himself won the prize in 1944; Polykarp Kusch won the prize in 1954; Julian Schwinger in 1964; and Norman Ramsey in 1985. In addition, Jerrold Zacharias would eventually hold the highest faculty position, university professor, at the Massachusetts Institute of Technology; Donald Hamilton became the head of the physics department at Princeton University; Sidney Millman rose to an executive position at AT&T's Bell Laboratories; and Jerome Kellogg became a division director at the Los Alamos National Laboratory. Scientific research is an intensely personal, private, and competitive activity. Ideas take form in the quiet of an individual's mind. Honors come to individual scientists whose ideas determine the direction their science takes. At the same time, scientific research is strongly influenced by interactions among scientists and by group dynamics. As we shall see, both the personal and group aspects of research worked together in Rabi's group at Columbia. 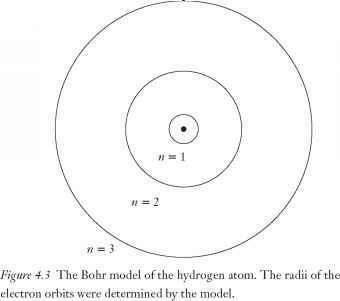 When Rabi and his students started the magnetic resonance experiments on the hydrogens, it was assumed that the strong force acting between the protons and neutrons inside a nucleus was, like the gravitational force, a central force acting along the line connecting these nuclear building blocks. Such a force acting between particles in the nucleus would give the collection of protons and neutrons a spherical shape. That was the considered wisdom when the series of experiments on the hydrogens, begun in 1934, continued through 1938. The objective of the 1938 experiments was to measure the magnetic moments of the hydrogen and deuterium nuclei as accurately as possible. In 1938, however, a new sense of promise inspired the members of Rabi's group as they prepared to apply the new resonance method to the hydrogens and to measure the magnetic moments of the proton and the deuteron to a new level of precision. Eventually, this objective was accomplished successfully, but not without surprises that led to new basic knowledge about the atomic nucleus. 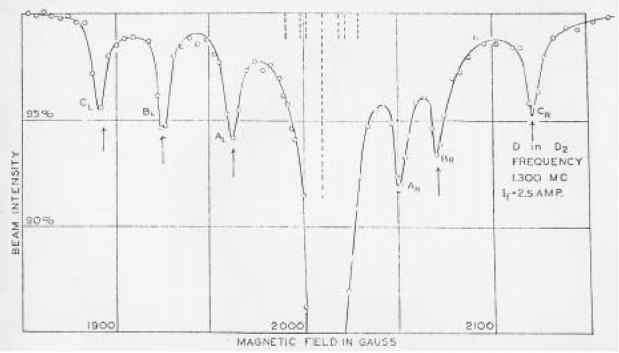 When the resonance method was applied to measurements on the hydrogens—H2, HD, and D2—beginning in mid-1938, the expectation was that the detector would sweep out a single, relatively sharp resonance peak shaped like the curve in Figure 13.4. However, Ramsey, who was doing the experiment, found something very different for H2 and D2. For H2 they saw a broad, jagged curve with no well-defined peak, whereas for D2 they observed a single broad peak with weak, featureless wings (see Figure 13.3). At this time, Ramsey was seeking an experiment that would serve as his dissertation topic, for which he must be the sole author, as required by Columbia University. Since these strange features of the H2 and D2 resonances were thought to be effects of the apparatus, Ramsey was asked to study them. Figure 13.2 The initial line shape for H2 as taken from Ramsey's 1938 lab notebook. 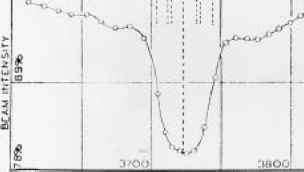 Figure 13.3 The initial line shape for D2 as taken from Ramsey's 1938 lab notebook. These crude initial data should be compared with the refined later data shown in Figure 13.4 below. the feeble wings of the D2 resonance and discovered that these wings also revealed multiple resonances. Furthermore, these resonances were spread much further apart than those of H2. This result was puzzling and indicated that there was something else going on in D2. Ramsey was surprised. Ramsey sent his data to Rabi, who was teaching at Stanford University during the summer of 1938, with a telegram: "What's doing this?" Ramsey kept exploring possible explanations. On September 14, he wrote in his notebook, "Can apparatus make the wings?" To resolve this question and to improve his data, Ramsey decided to redesign the apparatus. By this time, however, it was clear that something strange and possibly important was going on. Rabi once said in reference to his research group, "We were an honest-to-goodness team." So it was that when Rabi returned from Stanford in mid-1938, the team nature of Rabi's research group asserted itself. Since Rabi sensed that something significant lurked in the peculiar signal shapes, he invited other members of his research team to participate in this potentially important experiment. As a result, Ramsey had to find another dissertation topic. The next series of experiments began with a beam of deuterium molecules coursing through the newly designed apparatus. Methodical refinements were made from one experiment to the next, and in the process more and more specific details emerged from the "wings." By the end of the series of experiments, the details revealed were stunning. From the data shown in Figure 13.4 it is clear that the central large resonance is surrounded by satellite resonances—three on each side. It was the central resonance that gave the magnetic moment of the deuteron to high precision. The satellite resonance peaks required a new explanation. To put the matter more accurately, it was not the satellite resonances themselves that were surprising, it was the large spread of these smaller resonances. The theory of the Rabi group predicted small resonances, but their predicted positions would have subsumed them under the large resonance and they would have been difficult, if not impossible, to observe experimentally. Something new was causing these satellite resonances to spread out and away from the central resonance. The spread was six times larger than their working theory predicted. The cause of this spread was a new and unexpected property of the atomic nucleus: the electric quadrupole moment. Figure 13.4 The resonance data for D2 from which the quadrupole moment of the deuteron was determined. charge density and two centers of negative charge density. Such a distribution of charge densities gives the deuteron an electric qua-drupole moment. This is what Rabi and his students discovered. The discovery of the deuteron's quadrupole moment in early 1939 was a complete surprise. "Indeed, when these experiments were started there was no question of investigating such a quadru-pole moment, because current theory predicted, under the assumption of central forces between proton and neutron, that the deuteron . . . possesses ... no electrical . . . quadrupole . . . moment. "1 With these words, the publication of Rabi and his group announced the discovery of the quadrupole moment of the deuteron. The new force that replaced the central force was more complicated. A central force acting between two objects depends only on the magnitude of their separation. The presence of a quadrupole moment within the deuteron required a tensor force that depended not only on the separation between protons and neutrons, but also on the angles that their spins make with the line joining them. Once again, hydrogen surprised physicists. A firmly held assumption about the nature of nuclear forces was squashed by nature's simplest atom and, in the process, it projected a new direction for physical theory.